Anthony Bruce retired after indicting Frank Parlato. Parlato in turn has accused him of suborning perjury and fabricating evidence. 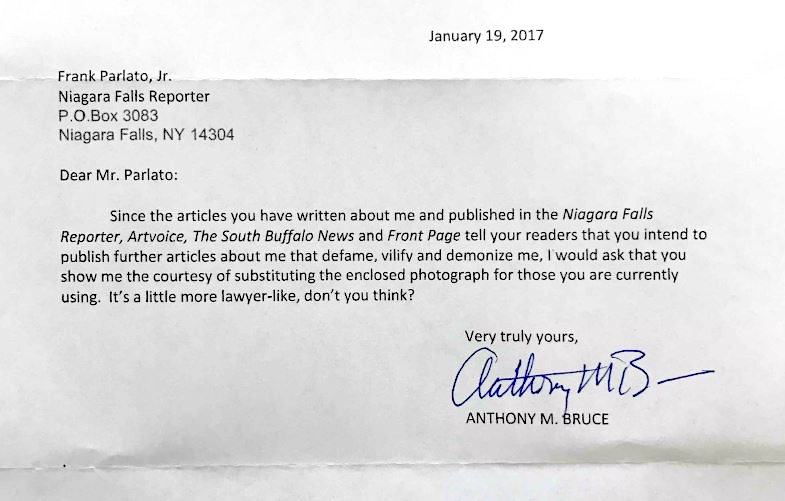 One of several letters Anthony Bruce wrote, unsolicited, to me. For the growing number of readers who eagerly await the next in the series on former Assistant US Attorney Anthony M. Bruce, there is some news. Mr. Bruce has sent me a series of letters giving snippets of his view of his side of the stories – and there are many – about people, I suspect, he falsely tried to prosecute. Mr. Bruce sent seven letters, some of them handwritten, some typed. All were mailed to my post office box. I hope to publish them and address the issues he raises in an article very soon. Meantime, I continue to get calls from people who claim Mr. Bruce abused them through color of law. There are transcripts I obtained which show some judges had an understanding of how he abused the process. I will quote from these. I have spoken to witnesses who claim he asked them to lie; people who say he doctored documents; innocent people who narrowly escaped prosecution for the weight of government can put innocent people in jail. These are shocking stories of people he accused who were acquitted. I wonder if any man has such a record of losing as he did. In any event, I received two handwritten letters from Mr. Bruce before press time. And I want to be fair to Mr. Bruce even if, as some say, he never was fair to anybody who got in his way. But he took the time to write. Sometimes his letters seem raving; some used words meant to insult; some were angry. In some however I enjoyed his use of English. And it was hard not to like the guy when one of the letters came with his picture and a request that I use the picture in future articles which “vilify”, “demonize” and defame” him. I laughed and of course used the new picture. But this was contact he initiated, not me and in it he claimed I was vilifying him. I wanted to make sure I was writing the truth. If he is a villain let him be demonized. If he is honest – and if he could prove me wrong- then let that be proclaimed. But would Bruce speak on the record – or merely write letters? He said I demonized him. If he is not a demon he should not be afraid of telling the truth. Today I received two handwritten letters which appear to be written by you. Prior to today, I received five other letters…. [Your] letters ask for certain things such as to review a ruling (Knoll); interview persons (Rutherford), use a certain photo, and, I gather, provide clarification where you think you have been misrepresented. I will comply with any reasonable request. Going forward, I will be happy to seek your comments and include them in stories. If you choose to respond by email, you can be assured you will be accurately quoted – even if you criticize me. Presently I am writing about B.K. Kamdar, a witness named William Faust; a hearing in the Shane Buczek case; a parole violation of Vincent Sicurella and, if possible, the real point about Bronfmans, which you ask me to address in your latest letter. If you care to comment on any of these, let me know by email if possible. I may send you a message on Facebook in case this is not your regular email. If you do not wish to be contacted for comments, kindly let me know and I will not disturb you further. As it stands, Anthony M. Bruce sends me letters. He expects no reply yet complains about my articles after they’re written. When I proposed he comment before the article is printed so if he can demonstrate there is a mistake he can fix it, he writes “no more contacts”. He talks of being bold in terms of principles. Hew to those my friend. Be brave and defend your cases. By telling the truth, no one’s legacy can be defamed. Anthony Bruce sent this picture which he prefers to others used.